When NASA Security Chief Carol Danvers' genetic structure was melded with alien Kree DNA, Danvers was imbued with amazing powers - and an all-new Marvel hero was born! But before she became Captain Marvel, Carol Danvers was Ms. Marvel - with X-Men writer Chris Claremont weaving together complex plots and compelling characterization to craft her iconic original adventures! Witness Carol's first meeting with the Avengers! The debuts of Mystique and Rogue! Battles with Ronan the Accuser, Sabretooth and the Guardians of the Galaxy! And Carol's story reaches its epic conclusion in a Marvel milestone guest-starring the X-Men and the Avengers! 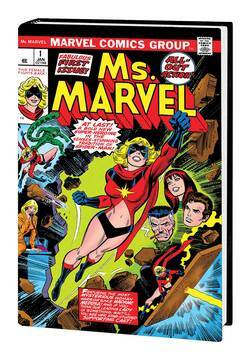 Collecting MS. MARVEL (1977) #1-23, MARVEL TEAM-UP (1972) #61-62 and #76-77, DEFENDERS (1972) #57, MARVEL TWO-IN-ONE (1974) #51, AVENGERS (1963) #200 and ANNUAL #10, and material from AVENGERS (1963) #197-199, MARVEL SUPER-HEROES (1990) #10-11 and MARVEL FANFARE (1982) #24. Rated T.